Floating off the shores of Mozambique in the turquoise waters of the Indian Ocean, Madagascar is a destination that’s sure to amaze you. The island’s rainforests, deserts, beaches and fascinating wildlife make it a natural paradise for outdoors enthusiasts. Madagascar’s flora and fauna is incredibly unique, only 10 percent of it can be found elsewhere in the world. It is also home to a quarter of the world’s primates and half of all chameleons. Add to this, several hundred types of frogs, snakes and bats and you’ll soon see why Madagascar is so incredibly special. 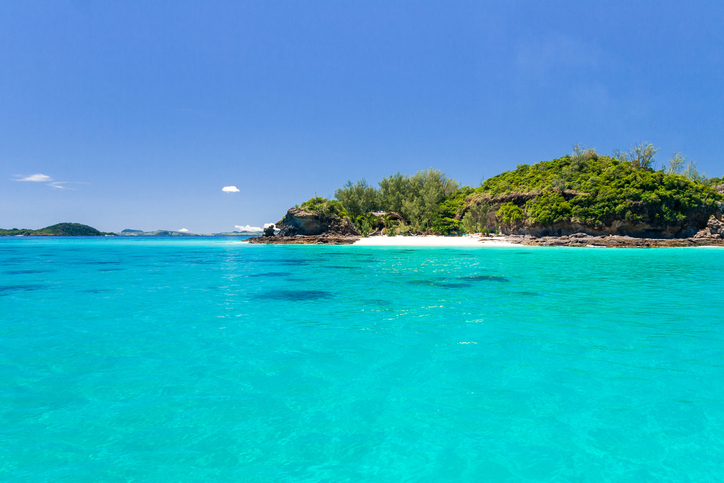 The Mitsio islands boast dreamlike beaches with glorious turquoise waters and world-class diving. They are also great places for kicking back and relaxing after a few days (or weeks) exploring nature’s wonders on foot. Here you can plunge into deep-waters at Nosy Be to discover a wonderland of barracuda, boxfish, starfish, rays, sea urchins eels, and plenty more exquisite marine life of the reef. Alternatively, charter a yacht or take a boat trip to explore from above the water. 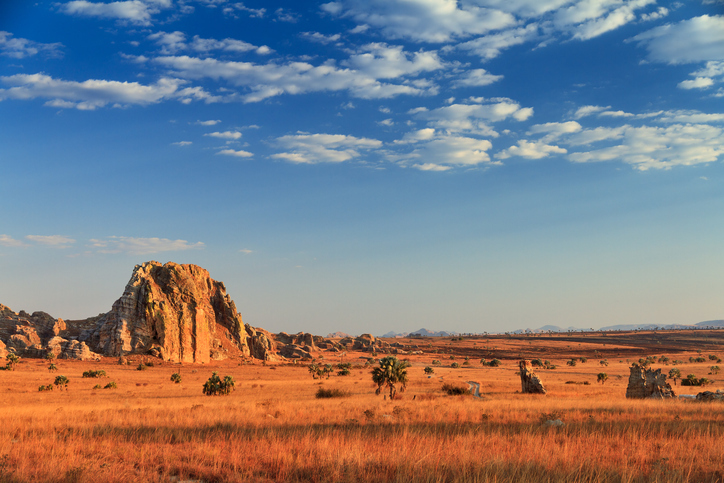 Madagascar’s most visited park is a must for avid hikers. The incredibly rugged Jurassic terrain has been formed by eroding winds and rain into a seemingly endless number of stunning gorges and canyons. The wildlife in Isalo isn’t as prominent as it is in Madagascar’s other parks, but this is more than made up for by the crystal-clear water falls and natural swimming pools – true oases after a day of hiking. The Piscine Naturelle and the Namaza circuit are just two of many must-sees, all of which require a guide. Close to the capital of Antananarivo, this is Madagascar’s most accessible and rewarding rainforest reserve. Here you’ll find an abundance of amphibians, reptiles and birds; however, the highlight is the indri, the largest of all lemurs. These creatures sing a haunting song, reminiscent of whale song, which travels for miles across the forest in early morning and at nightfall. The resident chameleons include the tiny nose-horned chameleon and the two-foot long Parson’s chameleon. Frogs are also plentiful as are birds – look out for the Madagascar blue pigeon, the coral-billed nuthatch and the Madagascar long-eared owl. 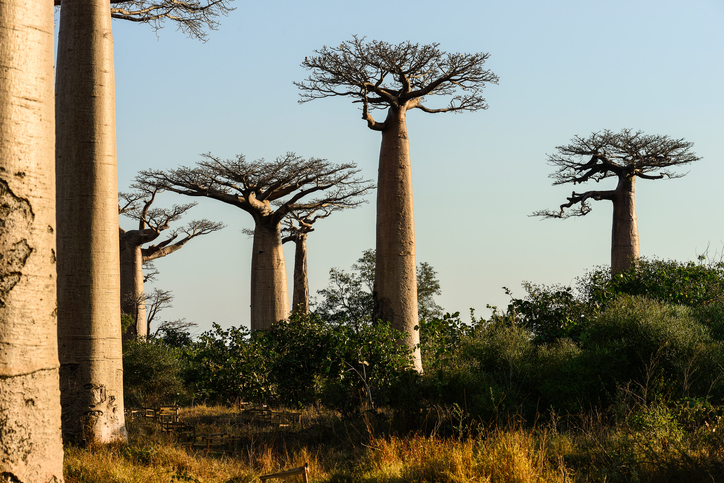 Widely regarded as the most beautiful road in Madagascar, this avenue of imposing Grandidier’s baobabs is a must-see. Located in the Menabe region of western Madagascar, it is best visited around sunrise or sunset in order to fully appreciate the red tones of the tree trunks – they are sure to have your camera snapping. The trees are up to 800 years of age and can grow up to 30 metres in height with some extraordinary Baobabs developing a trunk circumference of over 40 metres. For drivers, this bumpy and curvy road demands experience, so take it slow and you will be able to marvel at the magnificent trees safely as you go. The dry and inhospitably spiny forest in the deepest south of Madagascar is a unique and curious ecosystem. The trees are perfectly adapted to their tough, dry environment, preserving precious water in their succulent trunks and protected by sharp prickles giving them a distinctly otherworldly appearance. Amongst the trees are spiky octopus trees with their strange waving fingers, swollen baobabs and, the most dominant of all, Alluaudia proceras (Madagascar Ocotillo) which resemble a cactus and are a useful food source for lemurs as well as supplying wood and charcoal. The strange trees teem with even weirder wildlife: fearless white lemurs that leap, apparently unscathed by the thorns; birds singing continuously; and don’t forget the chameleon that lives most of its life as an egg. Twelve kilometres from the city of Tuléar, this wonderful botanical garden, opened by a Swiss amateur botanist in 1980, is home to some 900 plant species which are unique to Madagascar’s arid south. The arboretum is dedicated to preserving all plant species in south western Madagascar and its well-presented interpretation centre gives you the chance to learn about them along with how they are used for construction, culinary and medicinal purposes. Birder watchers also find this place interesting and there are bungalows (with a pool) to stay at if you wish to linger. Madagascar’s oldest national park is home to dramatic waterfalls, rainforests, orchids and the nation’s favourites: lemurs. At altitudes of between 850 and 1,475 metres, the mountain even has its own microclimate where you’ll easily spot Sanford’s lemurs and crowned lemurs as well as countless birds and reptiles. You will find plenty of broad, well-established trails here and refreshingly cool temperatures, making your exploration all the more comfortable. The best time to visit is between August and early December, after which the rainy season begins, lasting until April. You can spend days floating down the tranquil, impossibly beautiful Tsiribihina River towards the east coast, ending up near the Tsingy de Bemaraha National Park. For quieter waters, head for the Mangoky, Manambolo, Betsiboka, Mahavavy and the Onilahy Rivers. But even then the silence is never complete: insects keep chirping, branches fall and the wind blows for some of the best sounds of nature. River tours have been taking place since colonial times when well-heeled French visited the tobacco plantations. Today, with the same absence of roads, the river is still very much part of daily life. The UNESCO-listed Tsingy de Bemaraha is home to eleven types of lemur. 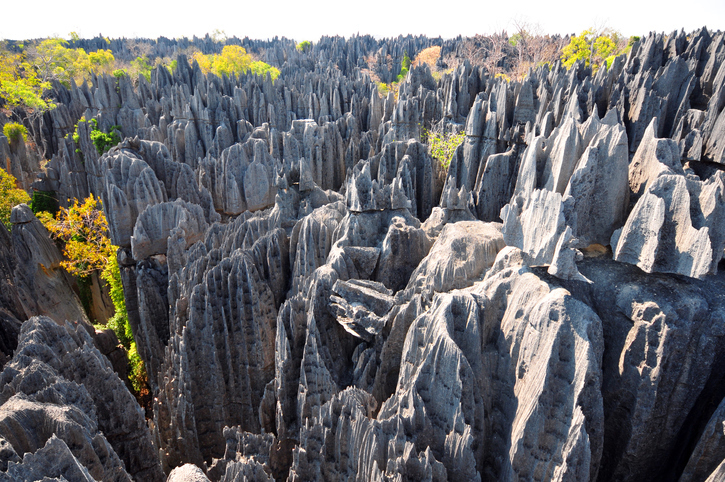 Tsingy translates as ‘where you cannot walk barefoot,’ which is apt due to its razor sharp pointed rock pinnacles – not that the lemurs mind as they swing from one jagged rock to another. The park is not for the faint hearted: 300ft drops and jagged, needle-like pinnacles can be walked through by traversing narrow wooden brides – check out tsingy, one of the most spectacular limestone karsts, for a landscape like no other. More other-worldly scenery awaits you in the lush, volcanic region of Ampefy. 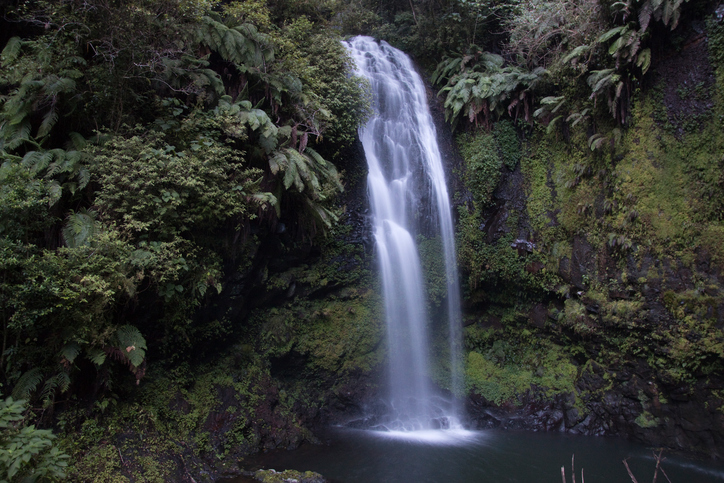 The area is renowned for its spectacular waterfalls and geysers along the banks of the serene Itasy Lake, the third largest in the country. Don’t miss the thunderous torrents of Chute de la Lily’s waterfalls cutting into the rolling hills – be prepared for a reverberating roar and another memorable experience.